After nearly a decade of campaigning and advocacy against monkey trade and animal experimentation, those in favor of the monkey trade, stand on the misconception that their endeavors are towards the benefit of the human race and advancements of science. While USA, India, Thailand and Israel acknowledge that animal experimentation is an utter cruelty to animals and downright insult to science, Mauritius falls into regression! Even though several local and international organizations have initiated actions against monkey trade and have exposed the cruelty behind this industry, there has been no change in regard to those six breeding facilities, namely Noveprim Group, Les Campeches, Biodia, Bioculture, BioSphere, and Prima Cyno,that are thriving in the country, at the expense of the lives and welfare of our macaques! The monkeys are separated from their mothers at a very young age, undergo stressful moments in traps and go through a plethora of cruel experiments before being exported. Mauritius seems to forget that monkeys are sentient creatures! They feel emotions and pain just as you, and we do. They get stressed out; they panic; they vomit; they suffer from rectal prolapse, lacerations and diarrhea; they fall into depression; they develop phobias. An undercover investigation carried out in Mauritius by Cruelty Free International showed that Biodia continues to take monkeys from the wild, terrorizing them, and destroying their family groups. The monkeys are brutally captured by grabbing and swinging them back and forth using their tails. They are then restrained by pinning their arms behind their backs. Frightening and painful procedures included monkeys being pinned down by several workers to have blood sampled and repeated testing for tuberculosis which involves the animals being injected into the upper eyelid. As tiny babies, the fully conscious monkeys are tattooed with the numbers used to identify them as they are sold around the world for research. While we do not know if these traumatic conditions are inhumane to you, at ELI Wooff we condemn such treatment to animals. However, we cannot blame these breeding these breeding facilities. While part III of THE Animal Welfare Act of 2013 permits animal experimentation in Mauritius, the act does not even specify who will be responsible for monitoring such projects, the requirements for being granted permission for an experiment, the housing conditions of the animals that will be used, and the necessary qualifications of the staff. Simply because monkeys do not have the capacity to voice out the savagery they undergo does not imply that humans can carry on inflicting barbaric behavior. Is it predestined that monkeys should live a life, waiting to be captured, then facing the numerous atrocities, and living the trepidation of being killed after the experiment? Is it predestined that monkeys are born in forests and then, spend a major part of their lives confined in cages- first breeding cages, then smaller weaning cages, export cages and finally transport cages? Certainly monkey trade reaps in a lot of money, and ‘relief’ to those wildlife conservators who claim that they pose a threat to the preservation of the flora and fauna of Mauritius. The money received during trade is around 2% of the whole income of the Tourist Industry. You will agree that, on comparison, this amount is rather insignificant. Then, why should Mauritius participate in the cruel and inhumane export of the macaque monkeys which is not only harmful to the monkeys but which also projects a cruel image of Mauritius on international platforms? There are better alternatives than the obsolete animal experimentation! Cruelty-free, ethical and more reliable non-animal alternatives include: computational based methodologies, in vitro testing using cell and tissue cultures, epidemiology, clinical studies on patients, and other non-animal methods such as pathological investigations (autopsies and biopsies) which are assuredly going to yield more precise results than painful and unnecessary animal testing. When your government took power in 2014, it pledged to work towards equality for all in Mauritius, and we believe that it will not go back on its words. We therefore appeal to you to review the stature of Mauritius in this trade and consider the ban of the monkey trade in Mauritius. We sincerely hope that our request to make Mauritius a more compassionate and equitable country will be taken into consideration. With all those promises that this government made, they should definitely be answerable to this! spare the monkeys please. Serious actions need to be taken to save our monkeys. they are suffering terribly!!!!! This a a very cruel situation for these primates. In 2016 animal abuse needs to end. The world sees what you do. 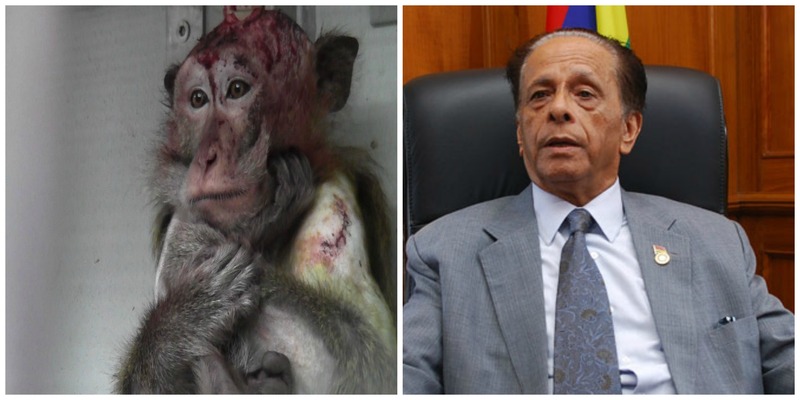 Dear Sir Arenood Jugnauth, Please stop the monkey trade from Mauritius to other countries and make us proud of our country! The world has change and such cruelty that these poor animals has to suffer is not acceptable anymore. This would fall to deaf ears. Such people never have any compassion for animals. I wish we all could have done something. You don't to be an economist to know why government do what they do. I feel very strongly too that any vet employ in the monkey farm should not be part of any animal welfare organisation .